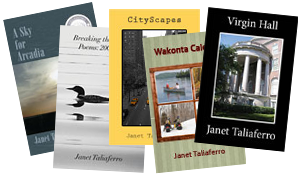 CityScapes ($5.99 kindle) is a collection of short stories set in different urban landscapes. The stories deal with everything from day-to-day challenges to life-changing situations. Most of the stories have a twist in the plot. Urban geography is the primary unifying theme in this collection of stories. Janet explores the human aspects of cities that hold much more meaning than can be captured by the idea of a collection of people living and working in close proximity. Each story deals with some aspect of human relations, like keeping secrets or acquiescing to family tradition, as well as the complexities of marital ties, parental influence, and personal ambition. After the conflicts of a long marriage, what sort of resolution can there be? Do we really understand the material and spiritual legacies of our families? How does a loving couple face the imminent death of one partner? Can there be unforeseen and even unknown consequences from a moment’s loss of temper? Does a wife simply ignore infidelity? What of the “other woman”? Can you recognize the good in a long-disliked relative? How is life complicated by alcohol, work, and travel? The short stories in the CityScapes collection vary in length from “short-short” to nearly a novella. Three stories were published in the The Northern Virginia Review, and two won “best short fiction” recognition. My original idea for the collection focused on setting the stories in various boroughs of New York City. As it turned out, some of the stories begin or end in New York but also carry the reader to other venues. One story is set entirely in another city, but the life challenges remain the same.